Recipe: St. Louis Chicken Spiedini – Eat. Drink. Hockey. Making Chicken Spiedini. We are enjoying a Cider and a Vodka & Tonic while cooking the white wine lemon butter sauce and mushrooms. 1. In a large bowl, stir together lemon juice, garlic, salt, pepper and parsley flakes; add chicken; stir to combine. Cover and allow to marinate 1 hour at room temperature. 2. Meanwhile, if not using the broiler, prepare a fire in the grill. 3. Toss together Parmesan and ¾ cup bread crumbs. Add chicken; mix well. Thread cubes onto skewers, leaving a little space between cubes. Roll skewers in additional bread crumbs, just to coat lightly. 4. Grill or broil, turning once or twice, until chicken is firm and crumbs are toasted, about 25 minutes. 5. To make the sauce, pour the wine and lemon juice into a saucepan over medium heat. Cook at a low boil until the liquid is reduced by about one third. Stir in cream, and simmer until it thickens. Gradually add the butter 1 tablespoon at a time to the sauce, stirring until completely incorporated. Season with salt and pepper. Remove from heat, and keep warm on very low heat. 6. Sauté mushrooms in a skillet with a bit of butter until golden brown; add to White wine lemon butter sauce. 7. Arrange chicken on serving plates, and cover with mushrooms and sauce. I was first introduced to Chicken Spiedini in St. Louis’s “The Hill” neighborhood at Zia’s, where it was served with a mushroom white wine lemon butter sauce, along with a side of pasta and red sauce. The meal of course started with another St. Louis specialty Toasted Ravioli. The following night we attended the St. Louis Blues – Vancouver Canucks game where it was St. Louis Cardinal’s night and we celebrated their World Series win. Tony La Russa, MVP David Freese, Chris Carpenter, and the World Series Trophy, participated in the ceremonial face off in front of a cheering arena. Since it was two-for-one hotdog night special if you wore your Cardinals’ gear, we enjoyed baseball hotdogs in a hockey arena. That was a first for me! 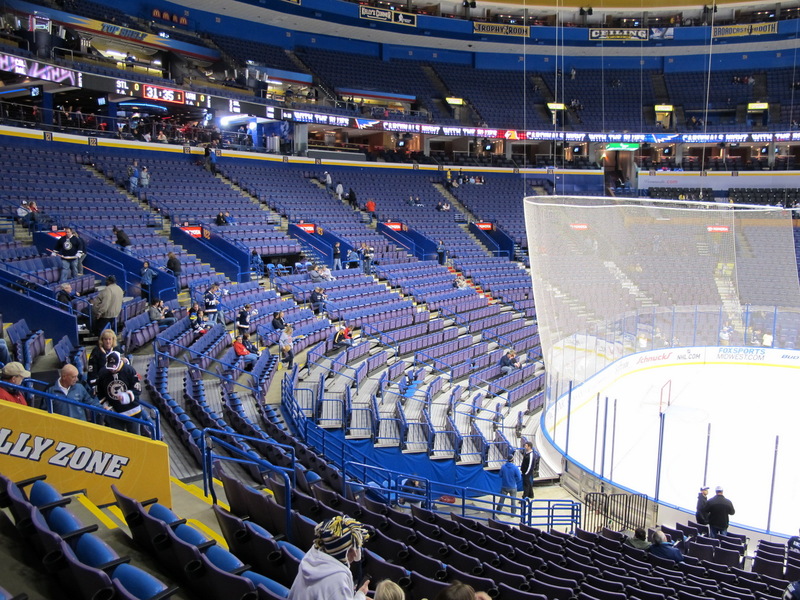 St. Louis Blues Arena – Scottrade Center. Blues vs. Canucks game. November 5, 2011. And yes, it’s Blue. Previous Post Tailgating. Hockey Style.